MIC. Marian Press (Stockbridge, Massachusetts, 2016). At 351 pages — not including various appendices and reference sections in the back of the book — “Champions of the Rosary” is easily the most exhaustive study of the devotional prayer known as “the rosary” that this reviewer has ever seen. The book is organized into three major sections: “History of the Rosary,” “Champions of the Rosary” and “Praying the Rosary.” There is no doubt that anyone who reads this book will be ever after the best informed on the rosary in his or her parish, if not his or her diocese. This slogan encourages the rosary not as a spiritual weapon but as a source of family health, strength and loving intimacy. Indeed, one might ask if the rosary, like any good form of prayer, isn’t primarily a means of nourishing loving intimacy with God and neighbor. Those who want a “spiritual weapon,” of course, are free to understand the rosary thus if they want to. Part I, “History of the Rosary,” attributes the rosary’s origin to a commission given to St. Dominic by Mary and concludes that this is an historical event. Father Calloway bases his conclusion on an 1891 secondary source written by an English Third Order Dominican, Augusta Theodosia Drane, who quotes what she claims are the actual words of Mary spoken to St. Dominic. Father Calloway quotes the words reported by Drane, but where Drane got her information is apparently unknown. One can only conclude that Drane repeated legendary material and gave the impression that it was historical. It is highly likely, then, that the account of the commission to St. Dominic by Mary is legendary rather than historical. This does nothing, of course, to reduce the credit due the countless members of St. Dominic’s Order of Preachers who promoted the rosary over the centuries. Part II of this book narrates the stories of no less that 26 “champions of the rosary,” ancient and modern. Beginning with St. Dominic (1170-1221), Father Calloway repeats his belief in the historical nature of the encounter between Mary and Dominic, relying more on hagiography than historical research. He includes quotations from numerous popes who also accepted the historicity of this event and repeated it. Modern “champions of the rosary” discussed in this part of the book include Pope Pius XII, St. Pio of Pietrelcina, St. John XXIII, Father Peyton, Blessed Paul VI, Archbishop Fulton Sheen, St. John Paul II and Pope Benedict XVI. “Champions of the Rosary” summarizes virtually everything ever written about the rosary and presents short biographies of virtually every “champion of the rosary” who ever lived. The author’s recommendation of the rosary seems to be based rather heavily on a fear-based devotionalism. Many devotees of the rosary may be more motivated to pray it out of love than fear. Regardless, “Champions of the Rosary” provides a resource on the rosary not to be found anywhere else. 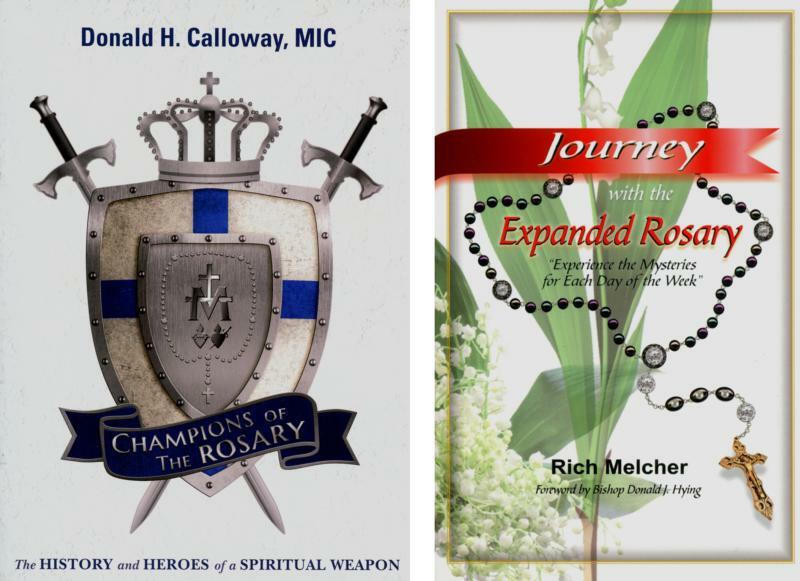 Rich Melcher’s “Journey with the Expanded Rosary” offers what he calls “tri-expanded rosary mysteries.” These are three biblically based sets of five mysteries, and Melcher’s aim is to add to, not replace, the traditional “mysteries” of the rosary. There are various ways to use this book, and the author provides several suggestions for how to do this. A welcome chapter, the final of the book’s eight chapters, explains the basics of how to pray the rosary. Some readers/pray-ers of the rosary will find the material provided by this book to be a significant addition to, and enrichment of, the rosary. Others may find it more confusing than enlightening. It will depend, most likely, on personal inclinations and preferences. Either way, this book is worth considering as a possible alternative to the standard approach to praying the rosary. Also of interest: “Praying the Rosary for Spiritual Warfare” by Father Dwight Longenecker. Our Sunday Visitor (Huntington, Indiana, 2016). 157 pp., $16.95. Finley is the author of more than 30 books on Catholic themes including “The Rosary Handbook: A Guide for Newcomers, Old-Timers and Those in Between” (Word Among Us Press).